Despite the recent financial troubles it seems that there is still many who happy to pay up to £25,000 per week to stay in the best Scottish castles, such as Aldourie (right), over the New Year. Sue Bourne of ‘Castles and Cottages‘ has about 50 castles available for rent with many booked over the festive period – though she noted that people are booking later either to try to secure discounts or even just to ensure they have the job to support such an expense. These rentals provide a valuable revenue stream which helps to offset the huge cost of running these houses and it’s encouraging to see that demand is holding up. Extensive void periods may have an impact in terms of the funds available for the essential maintenance or restoration these houses require. So ‘hurrah’ for the wealthy! 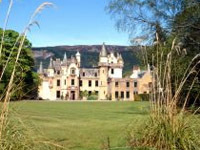 This entry was posted in News and tagged aldourie castle, country house, rental, scotland. Bookmark the permalink.